Conflict Medicine and the "Ecology of War"
Dr. Gus Abu-Sitta is the head of the Plastic Surgery Department at the AUB Medical Center in Lebanon. He specializes in reconstructive surgery. I did. During that time, a pan-Arab television channel, Al-Mayadeen, was broadcasting in English, with Arabic subtitles, a long two-part interview with me, about my latest political/revolutionary novel “Aurora” and about the state of the global south, and the upsurge of the Western imperialism. To my surprise, Dr. Abu-Sitta and his colleagues were following my work and political discourses. To these hardened surgeons, my foot ‘issue’ was just a tiny insignificant scratch. What mattered was the US attack against Syria, the Palestine [hunger strike], and the provocations against North Korea. G.A-S: In the South, medicine and the provision of health were critical parts of the post-colonial state. And the post-colonial state built medical systems such as we had in Iraq, Egypt and in Syria as part of the social contract. They became an intrinsic part of the creation of those states. And it was a realization that the state has to exercise its power both coercively, (which we know the state is capable of exercising, by putting you in prison, and even exercising violence), but above all non-coercively: it needs to house you, educate you, and give you health, all of those things. And that non-coercive power that the states exercise is a critical part of the legitimizing process of the state. G.A-S: Absolutely! And you had that contract existing in the majority of post-colonialist states. With the introduction of the IMF and World Bank-led policies that viewed health and the provision of health as a business opportunity for the ruling elites and for corporations, and viewed free healthcare as a burden on the state, you began to have an erosion in certain countries like Egypt, like Jordan, of the non-coercive powers of the state, leading to the gradual weakening of its legitimacy. G.A-S: Yes. In Europe as part of the welfare state that came out of the Second World War, the provision of healthcare was part of the social contract. As the welfare state with the advent of Thatcherism and Reagan-ism was being dismantled, it became important to undergo a similar process as elsewhere. The difference is that in the UK, and also in countries like Germany, it was politically very dangerous. It could lead to election losses. So the second plan was to erode the health system, by a thousand blows kill it gradually. What you ended up in the UK is the piece-by-piece privatization of the health sector. And the people don’t know, they don’t notice that the system is becoming private. Or in Germany where actually the government does not pay for healthcare – the government subsidizes the insurance companies that profit from the private provision of healthcare. 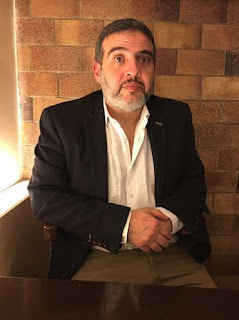 AV: Before we began recording this discussion, we were speaking about the philosophical dilemmas that are now besieging or at least should be besieging the medical profession. Even the social medical care in Europe: isn’t it to some extent a cynical arrangement? European countries are now all part of the imperialist block, together with the United States, and they are all plundering the rest of the world – the Middle East, Africa, parts of Asia – and they are actually subsidizing their social system from that plunder. That’s one thing. But also, the doctors and nurses working for instance in the UK or Germany are often ‘imported’ from much poorer countries, where they have often received free education. Instead of helping their own, needy people, they are actually now serving the ageing and by all international comparisons, unreasonably spoiled and demanding population in Europe, which often uses medical facilities as if they were some ‘social club’. G.A-S: I think what has happened, particularly in Europe is that there is a gradual erosion of all aspects of the welfare state. Politically it was not yet possible to get rid of free healthcare. The problem that you can certainly see in the United Kingdom is that health is the final consequence of social and economic factors that people live in. So if you have chronic unemployment, second and third generation unemployment problem, these have health consequences. If you have the destruction of both pensions and the cushion of a social umbrella for the unemployed, that has consequences… Poor housing has health consequences. Mass unemployment has health consequences. Politically it was easy to get rid of all other aspects of the welfare state, but they were stuck with a healthcare problem. And so the losing battle that the health systems in the West are fighting is that they are being expected to cater to the poor consequences of the brutal capitalist system as a non-profit endeavor. But we know that once these lifestyle changes are affecting people’s health, it’s too late in terms of cure or prevention. And so what the European health systems do, they try to patch people and to get them out of the system and back on the street. So if you have children with chronic asthma, you treat the asthma but not the dump housing in which these children are living in. If you have violent assaults and trauma related to violence, you treat the trauma, the physical manifestation, and not the breakdown of youth unemployment, or racism that creates this. So in order to sustain this anomaly, as you said, you need an inflated health system, because you make people sick and then you try to fix them, rather than stopping them from being sick. Hence that brain drains that have basically happened, where you have more Ghanaian doctors in New York than you have in Ghana. That ecology maintains itself well beyond of what we know is the shooting, because they alter the living environment of people. The wounds are physical, psychological and social wounds; the environment is altered as to become hostile; both to the able-bodied and more hostile to the wounded. And as in the cases of these multi-drug-resistant organisms, which are now a big issue in the world like the multi-drug-resistant bacteria, 85% of Iraqi war wounded have multi-drug-resistant bacteria, 70% of Syrian war wounded have it… So we say: this ecology, this bio-sphere that the conflicts create is even altered at the basic DNA of the bacteria. We have several theories about it; partly it’s the role of the heavy metals in modern ordnance, which can trigger mutation in these bacteria that makes them resistant to antibiotics. So your bio-sphere, your bubble, your ecological bubble in which you live in, is permanently changed. And it doesn’t disappear the day the bombs disappear. It has to be dismantled, and in order to dismantle it you have to understand the dynamics of the ecology of war. That’s why our program was set up at the university, which had basically been the major tertiary teaching center during the civil war and the 1982 Israeli invasion. And then as the war in Iraq and Syria developed, we started to get patients from these countries and treat them here. We found out that we have to understand the dynamics of conflict medicine and to understand the ecology of war; how the physical, biological, psychological and social manifestations of war wounding happen, and how this ecology of war is created; everything from bacteria to the way water and the water cycle changes, to the toxic reminisce of war, to how people’s body reacts… Many of my Iraqi patients that I see have multiple members of their families injured. AV: In my writing and in my films, I often draw the parallel between the war and extreme poverty. I have been working in some of the worst slums on Earth, those in Africa, Central America and Caribbean, South Asia, the Philippines and elsewhere. I concluded that many societies that are in theory living in peace are in reality living in prolonged or even perpetual wars. Extreme misery is a form of war, although there is no ‘declaration of war’, and there is no defined frontline. I covered both countless wars and countless places of extreme misery, and the parallel, especially the physical, psychological and social impact on human beings, appears to be striking. Would you agree, based on your research? Do you see extreme misery as a type of war? Let’s look at it from a different angle: what constitutes a war wound, or a conflict-related injury? Your most basic conflict-related injury is a gunshot wound and a blast injury from shrapnel. But what happens when you take that wounded body and throw it into a tent? What are the complications for this wounded body living in a harsh environment; does this constitute a war-related injury? When you impoverish the population to the point that you have children suffering from the kind of injuries that we know are the results of poor and unsafe housing, is that a conflict-related injury? Or you have children now who have work-related injuries, because they have to go and become the main breadwinners for the home, working as car mechanics or porters or whatever. Or do you also consider a fact that if you come from a country where a given disease used to be treatable there, but due to the destruction of a health system, that ailment is not treatable anymore, because the hospitals are gone or because doctors had to leave, does that constitute a conflict-related injury? So, we have to look at the entire ecology: beyond a bullet and shrapnel – things that get headlines in the first 20 seconds. AV: Let me tell you what I witnessed in Haiti, just to illustrate your point. Years ago I was working in Cité Soleil, Port-au-Prince, Haiti. They say it is the most dangerous ‘neighborhood’ or slum on Earth. The local wisdom goes: “you can enter, but you will never leave alive”. I went there with a truck, with two armed guards, but they were so scared that they just abandoned me there, with my big cameras and everything, standing in the middle of the road. I continued working; I had no choice. It was hot, flies and dirt everywhere… A man told me his wife had a huge tumor. 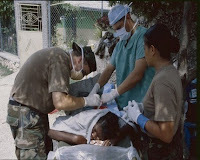 Without even checking what it was, the medics put her on a table, gave her “local” and began removing the stuff. After the surgery was over, a husband and wife walked slowly to a bus stop and went home. A couple of kilometers from there I found a well-equipped and clean US medical facility, but only for US troops and staff. G.A-S: In the Middle East, you still have people remembering when they had hospitals. Iraqis who come to my clinic remember the 80’s. They know that life was different and could have been different. And they are health-literate. The other issue is that in 2014 alone, some 30,000 Iraqis were injured. The numbers are astounding. We don’t have a grasp of the numbers in Libya, the amount of ethnic cleansing and killing that is happening in Libya. In terms of numbers, they are profound, but in terms of the effect, we are at the beginning of the phase of de-medicalization. So it wasn’t that these medical systems did not develop. They are being de-developed. They are going backwards. G.A-S: Now we have a big conference; basically the first congress that will look at all these aspects of conflict and health; from the surgical, to the reconstruction of damaged bodies, to the issues of medical resistance of bacteria, infectious diseases, to some absolutely basic issues. Like, before the war there were 30,000 kidney-failure patients in Yemen. Most dialysis patients are 2 weeks away from dying if they don’t get dialysis. So, there is a session looking at how you provide dialysis in the middle of these conflicts? What do you do, because dialysis services are so centralized? The movement of patients is not easy, and the sanctions… One topic will be ‘cancer and war’… So this conference will be as holistic as possible, of the relationship between the conflict and health. G.A-S: We have to imagine the health of the region beyond the state. On the conceptual level, we need to try to figure out what is happening? We can already see certain patterns. One of them is the regionalization of healthcare. The fact that Libyans get treated in Tunisia, Iraqis and Syrians get treated in Beirut, Yemenis get treated in Jordan. So you already have the disintegration of these states and the migration of people to the regional centers. The state is no longer a major player, because the state was basically destroyed. We feel that this is a disease of the near future, medium future and long-term future. Therefore we have to understand it, in order to better treat it, we have to put mechanisms in place that this knowledge transfers into the medical education system, which will produce medical professionals who are better equipped to deal with this health system. We have to make sure that people are aware of many nuances of the conflict, beyond the shrapnel and beyond the bullet. The more research we put into this area of the conflict and health, the more transferable technologies we develop – the better healthcare we’d be allowed to deliver in these situations, the better training our students and graduates would receive, and better work they will perform in this region for the next 10 or 15 years. North Korea War Bluff, Or Just Bluster? 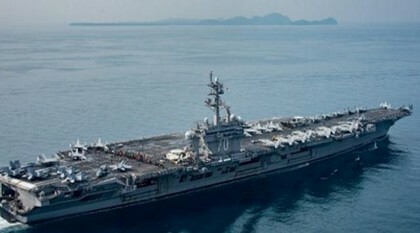 North Korea is threatening to destroy the US with its thus far largely undeliverable and sometimes unexplodable nuclear weapons, while the US, after an embarrassing navigational "mishap" that saw it steaming in the opposite direction, has successfully dispatched the USS Carl Vinson carrier battle group to a position reportedly within "strike range" of North Korea (but actually still in the South China Sea near the Philippines, some 1200 miles distant from North Korea), and now President Trump is threatening a possible attack on that country if it won't halt its nuclear weapons program. While I often find myself the pessimist in these kinds of crises, given the penchant for US presidents to turn to war as a default foreign policy option, I'm guessing that won't happen in this case, and for the same reason I that do not think we will see US troops confronting the determined ethnic Russian secessionists in eastern Ukraine. It's clear that for years now, the imperialist policy of the US government, under both Republican and Democratic presidents, has been to create chaos in regions of the world from the Middle East to Africa and Latin America, the better to control uppity countries like Libya, Syria, Venezuela, Bolivia and Brazil, whose leaders try to buck or stand up to US dictates. But it's one thing to overthrow a government and decapitate its leadership in a place like Libya or Syria, where no powerful state is located nearby to defend that country. It's altogether another to take on a country that lies right on the border of another nuclear power, as does Ukraine and the Democratic Peoples Republic of Korea. There was nobody to come to Col. Ghaddafy's aid when US-led NATO forces attacked his government, backing rebels seeking his overthrow, and left the country a chaotic mess, which it has remained now for six years. And until Russia stepped in, the same was true of US backing for Islamic rebels seeking to overthrow Syrian President Basher Al-Assad. Ukraine was something of an exception, with the US backing a coup in 2014 that ousted the country's elected pro-Russian president, installing in his place a pro-US regime, despite its bordering Russia. My sense is that US warmongers still thought Russia was a backwards mess in 2014, incapable of standing up and with a disfunctional military. When Russia acted, though, and made it clear, with the annexation of Crimea and with material support of ethnic Russians in breakaway Lugansk and Donetsk, that it would brook no departure of Ukraine into NATO's fold, the US backed off, despite plenty of bluster from the Obama White House and its laughably inept Secretary of State John Kerry. I'm predicting that the same thing will happen in the case of North Korea. The Trump administration may threaten to attack, but the bottom line is that a US attack on North Korea, or even a so-called surgical strike on its nuclear weapons development facility or a special forces attack on its leader, Kim Jong-un, would be viewed by China's government as a mortal threat to their country's national security, just as Russia views any effort to turn Ukraine into a US puppet and NATO member as a mortal threat to itself. Even South Korea, effectively a US colony since the end of World War II, has to be taken into consideration. Most South Koreans are aghast that the US would consider attacking the north. For one thing, the capital of South Korea, Seoul, is so close to North Korea that it is in range of thousands of large cannons, many of them well hidden and protected in tunnels in the north, which could rain down powerful shells on the city as devastating as any aerial bombardment campaign, and the people of Seoul still recall how their city was destroyed during the back-and-forth battling of the Korean War in the 1950s. For another, many South Koreans have relatives in the north, and don't want to see them killed or injured in another round or war on the peninsula. Finally, South Korea itself has a long history of popular resistance to both the country's corrupt and often autocratic compradore government and to the US military's occupation of the country and its dominance over South Korea's sown military. How such a populace would react to a new war on the Korean people of the north would be hard to predict in advance. Any way you look at it, a US-launched war against North Korea would be a very messy and probably long-running affair whose consequences could quickly include an armed conflict between US and Chinese troops, as happened the first time around with dreadful consequences, and that was before China had nuclear weapons and had sfar fewer ICBMs capable of putting them down on US cities from New York to Los Angeles. So for all these reasons, I'm betting that what we're hearing and seeing from the Trump White House is only bluster. Perhaps President Trump will find some face-saving way to cut a deal with China in which he'll target some missile launching site in North Korea, which would be warned in advance of an attack so most people could clear out of the area, and then it would be hit by a barrage of Tomahawk missiles launched by the Carl Vinson battle group, should his naval "armada" ever reach its destination in the Yellow Sea or Sea of Japan. Those missiles that manage to reach their targets would wreak some photogenic damage he could distribute to the domestic media and his remaining supporters, much as he did with his pre-approved airport raid in Syria. I hope I'm right on this. If I'm wrong, it won't much matter, though. 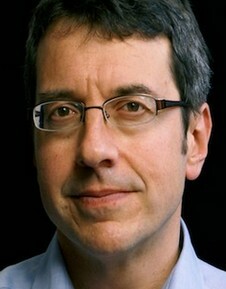 On foreign policy matters, Monbiot has regularly shown poor judgment. 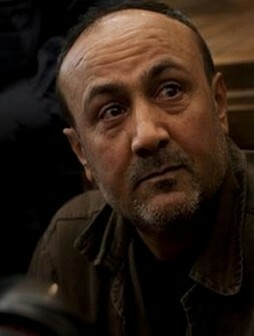 Since the attack on Iraq, he has posed not as a cheerleader for intervention but as a weary onlooker, reluctantly conceding that whatever US, British and other western intelligence agencies say – and the largely uncritical reports of these statements by liberal media like his own newspaper the Guardian – should be given the benefit of the doubt. It perhaps goes without saying that, as Monbiot has become less and less of a “contrarian”, he has turned his fire on those who insist on the right to be one. A few years ago that finally included Chomsky too, as I have previously discussed here. One of the problems with Monbiot’s latest “disavowal” – presumably from the leftists he castigates in his short piece – is that it offers no justification for what it claims to be justifying. A day later, he was “99%” sure Assad’s government was responsible. Trump’s illegal attacks on Syria were only “symbolic” – a symbolic war crime, presumably – and would allow Assad to “carry on as before”. Did he mean Trump needed to launch more than a symbolic attack? That he needed to ratchet up the violence to stop Assad “carrying on as before”? It is this kind of irresponsibly ambiguous language – from a journalist skilled in the use of words – that can serve only to aid an agenda Monbiot says he opposes. Even if we assume the criticisms of Postol’s work are based in evidence and factually right (and neither he nor I are in a position to know that), he did not wait for Postol’s analysis, or for the subsequent critiques of Postol’s work, to reach his own conclusions. In short, Monbiot’s mind was made up from the beginning. That – and only that – is what he is being reprehended for by the vast majority of his critics . But there is an even more important issue here, at least for anyone who is really interested in getting to the truth of what happened, and wants to stop official narratives being abused to promote greater western military intervention (and suffering) in Syria. We need more of an engaged debate about evidence, not less of it. Postol, Blix and Ritter may all be wrong. But they should have a fair hearing and their arguments should be fully engaged with in the mainstream – especially, in supposedly liberal media outlets like the Guardian. Anyone who wants to understand what happened in Idlib must also want a vigorous and open debate that most members of the public will have access to. So how much coverage have these counter-narratives received in the corporate media? Precisely zero coverage in the UK media, as Media Lens have pointed out. The evidence marshalled by the doubters has been shunted – as ever – into the corners of the internet, which is exactly where US, British and French officials want it. Is Monbiot protesting the lack of engagement with these counter-narratives and the evidence the experts – and they are experts, whether he likes it or not – have proffered? Is he demanding that his paper, the Guardian, give a hearing to Postol, Blix and Ritter? No, he most definitely isn’t. In fact, he has been doing the precise opposite. 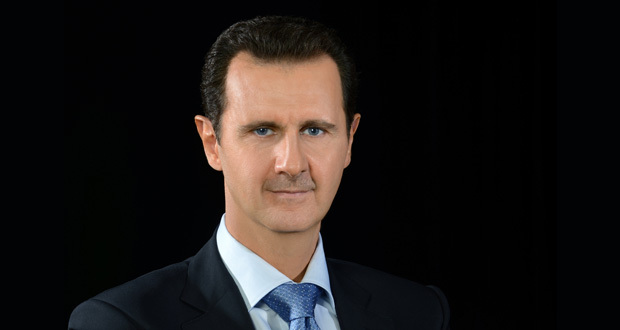 He has discredited the doubters, and even those who simply want the debate to take place, as Assad apologists. US media reports this week blamed North Korea for having a dastardly role in an alleged chemical weapons massacre in Syria. As if the two countries could not be demonized enough. The latest spin of the “axis of evil” suggests Washington is hell-bent on war. Demonize, dehumanize, destroy. That’s the logic being throttled by the Trump administration toward both North Korea and Syria. Now the two “evil dictators” are bonded in US media reports for complicity in the alleged chemical weapons attack earlier this month in Syria’s Idlib Province, where it is claimed Assad’s armed forces dropped toxic munitions on civilians, killing up to 80. The supplier of the alleged chemical weapons in Syria is the “Kim Jong-un regime” in North Korea, according to US reports. It goes on to cite claims that a “key supplier” of Syria’s chemical weapons arsenal is the northeast Asian nation. In other words, this so-called “expert” doesn’t really know. Professor Bechtol is making a conjecture. Reference to his past research on the subject of North Korea/Syria military links, in 2015, make sweeping assertions about how the two nations have collaborated on developing chemical weapons. Tellingly, the US “academic” makes a prominent citation of the CIA and other intelligence agencies in his assessment of North Korea and Syria’s military connections. Last week, Fox News accused the countries of having a “long history” of sharing chemical weapons technology, without providing any corroborating details. Meanwhile, a search in the database of the Stockholm International Peace Research Institute – a recognized authority on global weapons trade – finds there is scant transfer of military technology, including chemicals, between North Korea and Syria. 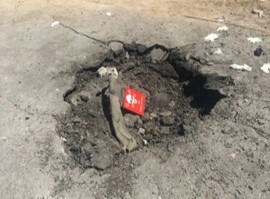 In any case, claims chemical weapons were deployed by the Syrian government also ignore earlier reports by United Nations agencies that all such munitions had been completely destroyed under a Russian-US brokered decommissioning deal in 2013. 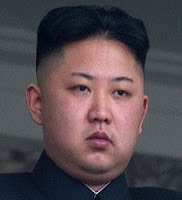 Media speculation Korean leader Kim Jong-un had some role in facilitating the death of civilians in Syria – due to alleged supply of lethal toxins appear to be orchestrated with the aim of demonizing. All the better, from the US propaganda point of view, because it brings him into the same target scope as Syria’s Assad, whom Washington has been trying to oust for the past six years in a proxy regime-change war. The game of “evil dictator association” is a reboot of the “axis of evil” narrative first announced by former US President G.W. Bush in 2002. In the wake of the 9/11 terror incidents, the Bush administration fingered six states as state terror-sponsors and pursuing weapons of mass destruction. The alleged “axis of evil” unveiled by Bush comprised: Iraq, Iran, North Korea, Syria, Libya, and Cuba. Of course, there were good grounds to suspect the narrative as a propaganda device, dutifully assisted by Western news media, as a way to target “rogue regimes” for American military attack. Iraq and Libya have been “dealt with.” Evidently, North Korea and Syria (as well as Iran) are a “work in progress” for Washington. The allegation of chemical weapons from North Korea to Syria is a transparent attempt at a frame-up. 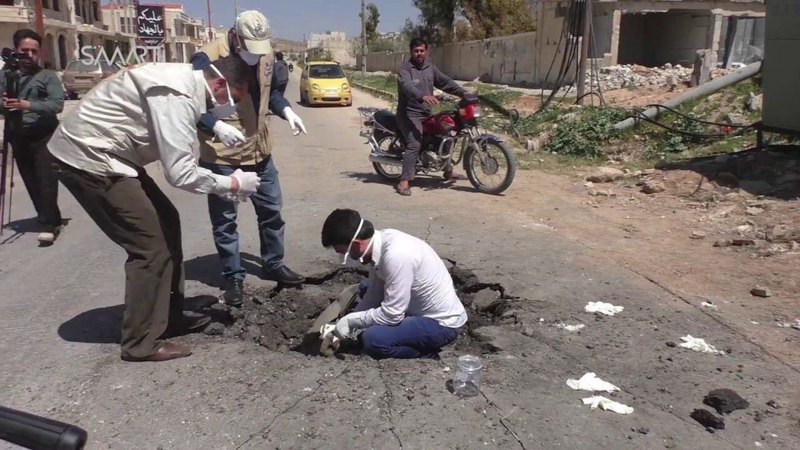 For a start, the alleged incident on April 4 in Khan Sheikhoun has relied solely on dubious videos sourced from terrorist-affiliated militants and their media agents, known as the White Helmets. 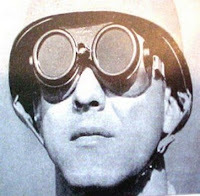 Several respected weapons authorities, such as MIT Professor Theodore Postol, dispute the claims asserted by Western governments and the media that Sarin gas was used. These authorities have also voiced concern that the whole incident was a propaganda stunt or false flag instigated by Western-sponsored militants in order to discredit the Assad government and justify US military intervention. “Gas a baby, and you can expect action,”declared Trump’s White House spokesman Sean Spicer unburdened of any legal standard. This is while the US, Britain, and France have blocked a formal request from Russia, Iran, and Syria for an impartial, on-site investigation into the Khan Sheikhoun incident. Russia’s Foreign Minister Sergey Lavrov said the Western powers showed they do not want to find out the truth of what really happened because their priority is pushing the agenda for regime change in Syria. The alleged connection to North Korea makes the propaganda drive even more seductive. Not only is Syria demonized without any proof, but now North Korea can also be vilified for having a dastardly role in “gassing beautiful babies,” as Trump would have it. The US targeting of North Korea with nuclear-capable submarines, warships, and intercontinental ballistic missiles has taken provocative threats against Pyongyang to a reckless level. Trump and his top officials have repeatedly warned recently that the US is ready to launch pre-emptive strikes on North Korea. It is arguable that US conduct amounts to acts of aggression. North Korea’s nuclear and missile program may have breached international sanctions, but the actions of the US and its allies holding war exercises are insanely disproportionate. The world is being put on a hair trigger for war, at Washington’s initiative. The Trump administration, given free rein by supine news media, is making the incendiary claim that “it fears time is running out” on stopping Kim Jong-un from obtaining a nuclear missile capable of hitting the US. If the US launches a pre-emptive strike on North Korea, it will probably be devastating, as the Trump administration has warned. The extraordinary dropping of the Mother of All Bombs in Afghanistan earlier this month seems to have been a macabre rehearsal for what would otherwise be seen as a horrific attack on North Korea. Smearing the North Korean leader with alleged atrocities by chemical weapons in Syria is another grim pointer that the US is preparing to commit a catastrophic crime. By a process of demonizing and dehumanizing, it is creating a license to destroy. However, such demonic US behavior should actually turn world attention to who exactly is the real axis of evil and number-one threat to peace. Today all of Palestine is on strike in solidarity with the fasting prisoners and tomorrow is a day of indignation, demonstrations, and confrontations with the occupiers. Bethlehem is a ghost town and all shops and public transportation are closed and Israeli helicopters are in the skies. [Volunteers came to museum and we are taking a group on tour of the wall and impact of settlements on the environment because this is not work but resistance]. Tomorrow is a day of demonstrations and confrontations. In this message I just want to reflect on why this is very important. Every day we encounter greedy people focused on their own needs and unhealthy desires. How many cheated us? How many come around us because they have some material interest? How many corrupt politicians do we know? How many people we know turn out to be kinder and gentler and more self-sacrificing than we thought? How many turned out more mean, more selfish, more sadistic? Looking at the world in this fashion (some would claim it is seeing reality) can be truly dispiriting. It can remove any remaining humanity in many people. But then comes a prisoner hunger strike! It sounds small but it touches a cord in human beings bigger than any other and I will argue it is the way to reclaim our humanity. death or imprisonment. It is the antithesis of selfishness and greed. 800,000 Palestinians tasted life in prison and today almost 7000 are there in the colonial apartheid Israeli prisons. While everyone knows this, the hunger strike brought the prisoners' message home to all - rich and poor, greedy and self-sacrificing, honest and liar. This message is nothing short of that we humans must reconnect to our humanity and that caring for others is the way to save humanity. In this 21st century with weapons of mass destruction and climate change, we cannot afford as a species to do otherwise. Prisoners show us the way like many decent human beings showed us the way before (think of Jesus and prophets and revolutionaries like Che Guevera). But the alarm bells for us are now alarm bells for a dying species unless we act. It is more urgent than ever in our short history on earth. We really have a choice to make and it is both an individual and a collective choice. That choice is to either accept war and greed as "natural" and follow the other human lemmings over the cliff OR resist and give of ourselves as a way to save humanity. Mahatma Gandhi used hunger strike to refocus people away from greed and selfishness to caring for each other. Hunger is painful and people will die sooner or later unless we all act. What is at stake is very high: our own self-respect (dignity) as human beings. But as the world changed, the danger is that we can also go extinct as a species unless we manage to collectively transcend a huge baggage of greed, colonialism, and capitalism that cannot be sustained in the 21st century. Palestinian prisoners by their silent deeds of self-sacrifice have shown us the way. As did martyrs like Basil Al-Araj who simply noted that in his extremely short last words on paper: there is no more eloquent speech than the deed of the Martyr. The prisoners and the martyrs gave silently of themselves. For the rest of us, where we stand today and tomorrow will say a lot about who we are. Here is a relevant article I wrote seven years ago "The Savior in Each of Us"
Thanks to the generosity of our readers, we have gotten to within about $5,000 of our spring fund-drive goal of $30,000, an important target so we can continue this important independent news Web site. If you haven’t contributed yet, any amount that you can afford will help. You can donate by credit card online (we accept Visa, Mastercard, American Express and Discover), by PayPal (our PayPal account is named after our original email address, “consortnew @ aol.com”), or by mailing a check to Consortium for Independent Journalism (CIJ); 2200 Wilson Blvd., Suite 102-231; Arlington VA 22201. 1960s spy fiction is some of my favorite fiction. Developing its own unique aesthetic, from Bond to The Saint to Harry Palmer, the vivid, flamboyant style of both the spies and their cinema incarnations created an iconic pop phenomena that survives still (as 007 is still going strong). Everyone knows 007, but few are aware of the more philosophical, science fiction based British cult show, The Prisoner starring Patrick McGoohan. 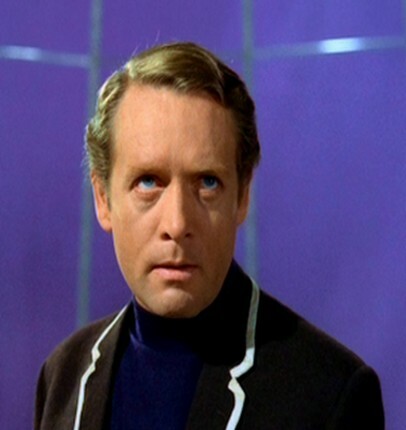 McGoohan not only starred in the show, but is also the series’ co-creator, following his successful Danger Man series, and reportedly passed over the role of Bond in Dr. No and The Saint due to moral qualms with 007’s ethics (McGoohan was a professing Roman Catholic). Regardless, The Prisoner remains one of the most fascinating presentations of the dark side of international espionage, combining the esoteric, philosophical, geopolitical and the fantastical, as well as functioning as a critique of the most foundational assumptions of modern, “progressive” man. For this, it most certainly warrants an analysis. How a growing technology gap between the U.S. and its nuclear- armed rivals could lead to the unraveling of arms control agreements — and even nuclear war. The upgrade — part of the Obama administration’s $1 trillion modernization of America’s nuclear forces — allows Washington to destroy Russia’s land-based nuclear weapons, while still retaining 80 percent of U.S. warheads in reserve. If Russia chose to retaliate, it would be reduced to ash. The Hiroshima bomb exploded with a force of 15 kilotons, or kt. The Nagasaki bomb was slightly more powerful, at about 18 kt. Between them, they killed over 215,000 people. In contrast, the most common nuclear weapon in the U.S. arsenal today, the W76, has an explosive power of 100 kt. The next most common, the W88, packs a 475-kt punch. But MAD is not a U.S. military doctrine. A “first strike” attack has always been central to U.S. military planning, until recently. However, there was no guarantee that such an attack would so cripple an opponent that it would be unable — or unwilling, given the consequences of total annihilation — to retaliate. The technical breakthrough that suddenly makes this a possibility is something called the “super-fuze”, which allows for a much more precise ignition of a warhead. If the aim is to blow up a city, such precision is superfluous. But taking out a reinforced missile silo requires a warhead to exert a force of at least 10,000 pounds per square inch on the target. So far, the world has managed to avoid a nuclear war, although during the 1962 Cuban missile crisis it came distressingly close. There have also been several scary incidents when U.S. and Soviet forces went to full alert because of faulty radar images or a test tape that someone thought was real. While the military downplays these events, former Secretary of Defense William Perry argues that it is pure luck that we have avoided a nuclear exchange — and that the possibility of nuclear war is greater today than it was at the height of the Cold War. According to the Bulletin of Atomic Scientists, the 1995 crisis suggests that Russia does not have “a reliable and working global space-based satellite early warning system.” Instead, Moscow has focused on building ground-based systems that give the Russians less warning time than satellite-based ones do. What that means is that while the U.S. would have about 30 minutes of warning time to investigate whether an attack was really taking place, the Russians would have 15 minutes or less. A recent study found that a nuclear war between India and Pakistan using Hiroshima- sized weapons would generate a nuclear winter that would make it impossible to grow wheat in Russia and Canada and cut the Asian Monsoon’s rainfall by 10 percent. The result would be up to 100 million deaths by starvation. Imagine what the outcome would be if the weapons were the size used by Russia, China, or the U.S. The Russians and Chinese have missile-firing submarines as well, but not as many, and some are close to obsolete. The U.S. has also seeded the world’s oceans and seas with networks of sensors to keep track of those subs. In any case, would the Russians or Chinese retaliate if they knew that the U.S. still retained most of its nuclear strike force? Faced with a choice committing national suicide or holding their fire, they may well choose the former. The new Russian cruise missile may indeed strain the Intermediate-Range Nuclear Forces Treaty, but it is also a natural response to what are, from Moscow’s view, alarming technological advances by the U.S. Had the Obama administration reversed the 2002 decision by George W. Bush’s administration to unilaterally withdraw from the Anti-Ballistic Missile Treaty, the new cruise might never have been deployed. There are a number of immediate steps that the U.S. and the Russians could take to de-escalate the current tensions. First, taking nuclear weapons off their hair-trigger status would immediately reduce the possibility of accidental nuclear war. That could be followed by a pledge of “no first use” of nuclear weapons. If this does not happen, it will almost certainly result in an accelerated nuclear arms race. “I don’t know how this is all going to end,” Putin told the St. Petersburg delegates. Foreign Policy In Focus columnist Conn Hallinan can be read at: dispatchesfromtheedgeblog.wordpress.com and middleempireseries.wordpress.com.